I don’t hit a lot of greens. Nine would be a good day for me. That means I have to chip and putt in order to keep my score down. The short game, BTW, doesn’t lower your score. It keeps it from going up. But that’s a different post. So when I go to the range I always practice chipping and putting. I’ll take one chip, hit it about six times, then putt out each ball. Par is 14. What I learned a few days ago, or rather finally realized for good, is that when you chip you should pick a landing spot and try to hit that, letting the ball run out as it will. That style will give you much more control of where the ball goes. Now the run-out is important. You can’t just let it happen. For example, you have to know how much each of your chipping clubs will release. You also have to hit the stroke consistently to get the release you intend. But the important point is where the ball lands. That is what governs all your other choices. Thinking in that way will give your chipping a tremendous boost. If you follow this blog, you know that is what I call my driver. Because we want to hit the ball a long way, we alter our swing and end up hitting it shorter and in who knows which direction. The driver is built to hit the ball a great distance. Stay out of its way and it will! Here’s a great drill to convince you of that. Take out your sand wedge and hit a 70-yard, or so, pitch. That should be an effortless shot with this club. Now take out your driver and put the same swing on the ball. That you’re standing up a little straighter should be the only difference. Hit one drive and go back to the wedge. Keep alternating, one ball with each club. After about three or four times through the cycle, I will bet (hope) that the wedge has rubbed off on you, and you are making an easy pass at the ball with your driver and the ball is going straight and long. If you can learn to swing your driver like this, you might not hit that once-a-month bomber, but you will be putting the ball in the fairway much more often, and with more than enough distance. That’s why when we hit golf balls we need to carefully investigate what we are doing, and not seek a particular result. 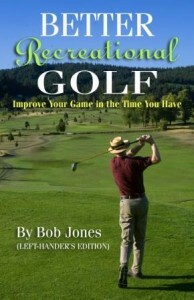 Percy Boomer talks about this in his book, On Learning Golf. 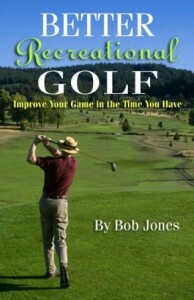 The number one Golf Bogey, as he calls it, is the natural urge to act in the obvious way to achieve the desired result. (his italics). What he meant by this is concentrating on the result of the swing (the ball landing in the fairway or on the green) at the expense of the correct technique by which that end may be gained. He borrows a term from F. Matthias Alexander and calls people who do this end gainers. On the practice tee, this means putting a patch on a patch until the swing finally produces a straight shot. The resulting swing can’t possibly last beyond the groove that was set up during those few golden minutes, because that swing is not built on any known swing principles. You could go practice putting for a half-hour and come back to the tee and have no idea how to re-create that swing. And that would be a good thing. Rely instead on sound instruction and your efforts to apply that instruction. Learn the principles that make your swing work. At the same time, learn the things you do that cause your swing to fail. Practice how to do the one and how to avoid the other. You might at first have a list of five things you need to do. Practice them all, looking for ways to combine them so that the five become four, then three, then two, and finally you have one swing. That’s it. Better golfers feel their swing as a whole. End gainers feel it as parts that lead to a result, but those parts are never the same from day to day. It might take more than one lesson to learn what these principles are (big news flash, right?). Keep taking them until you get it. When you hit balls, practice those principles and use the golf ball as an indicator. Where the ball goes is irrelevant. Concentrate on what you have to do. When you do the right things, the golf ball will reward you. I firmly believe that keeping your mind in check as you swing is more important than having the best swing technique. I have a book coming out soon on that subject, but I’m not here today to plug my book. I’m going to give you an experiment to try. Every time you swing, think of nothing but a loose, graceful swing with the same tempo and the ideal 3:1 rhythm. If you haven’t figured that out yet, see this post first. Do not worry about where the ball goes or what kind of contact you get. Just keep your mind on that rhythm. Avoid trying to correct some technical point if you don’t hit a great shot. There are two technical points you do need to be aware of, though. 1. Set your grip pressure loose at address and keep it loose throughout the swing. Consciously avoid clenching your hands. 2. Start down from the backswing with a body turn and let your arms and hands come into the picture when it’s their turn. They follow. Do not let them lead. Hit maybe ten shots with your 7-iron and switch to your driver for about three. Repeat. Again, your only goal is to feel that loose, rhythmic swing before you step up to the ball. How to do that in your mind is a tricky thing, because you can be concentrating on it intently and turn it into a technical thing. It is, but you can’t think it is. Stand there for a moment and feel in your mind the gentle backswing going upwards and the matching swing downwards and through the ball. Feel the rhythm of it, the grace of it. Then step up to the ball and swing with that same feeling in your mind. The last thing on your mind should be hitting the ball. I would like you to both see the ball and forget that it’s there, at the same time. That sounds odd, but you can do it. It will help a lot if, when you’re hitting the 7-iron, to put it on a tee–a really short tee, just enough so the ground is not an element in striking the ball. If you have errant ball flight or mishits, it’s because your mind wandered. Do not try to fix a physical swing technique. The correction to make is in your head. Feel that flowing swing and copy it. That’s what you’re learning to do here. It will take a great deal of mental discipline to avoid reaching back for a technical fix. That’s a good thing to learn, too. 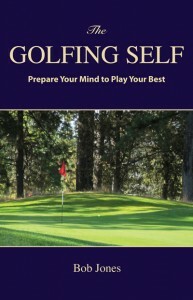 Controlling your mind on the course is how you hit good shots, and you know that, but do you ever practice that? Probably not, because no one has shown you how. That’s what I’m showing you now. Here is what I think you want out of your golf swing. You want to step up to the ball, address it, take a look down the fairway, and just make an effortless pass at the ball and see it fly straight and far in the direction you want it to go. You can have that swing if you train your mind to be doing the right thing when you swing. This experiment teaches you what that right thing is. I would guess the biggest day-to-day problem in golf is not anchored putting, or the juiced-up ball, or LPGA players who need their caddy to help them line up their shot. It’s slow play. Slow play is terrible on the PGA tour, rampant on the LPGA Tour, and a disease in college golf. All of that trickles down to recreational play and it drives most of us nuts. There are all sorts of suggestions about how to play faster. Ready Golf was a valiant attempt to get things moving along, but it turned out that people played Ready Golf slowly and we’re right back where we started. Slow play is caused by slow people. They don’t just play golf slowly. They do everything slowly. They have slow lives. That’s their pace. No amount of faster play tips is going to speed them up. I think, though, that the problem is not slow play, it’s inefficient play. Three golfers wait for the fourth to get everything done before the next one starts, instead of overlapping their activity. Example 1: One player tees off, picks up the tee, and walks back to the group standing well off to the side. Then the next golfer walks on to the tee box, etc., in sequence. Instead, the next golfer to play should already be standing beside the tee box when the golfer on it is hitting, and stepping on as soon as the ball is struck. Example 2: One player in the fairway looks over the shot, takes out a club, does whatever, hits the ball, and puts the club back in the bag. Then the next player starts up. Instead, Player B should have a club out of the bag, ready to hit, by the time Player A is addressing the ball. Example 3: One player marks his ball, cleans it, puts it down again, reads the green, putts, goes up to this ball and marks it, then the next player starts up. Instead, every player in the foursome can read their putt as soon as they get on the green, so everyone is reading the green at the same time. Overlapping play, which is efficient, is an easy solution to the slow play problem. You read it here first. For example, can you hit a 9-iron, and 8-iron and a 7-iron 120 yards? Same distance, with different clubs? If so, then you can play in the wind, play to different pin positions, or even have a safer shot to play when another one isn’t working so well that day. The same thing would be true for your wedges. If a pin is 40 yards away, can you hit into it with a gap wedge, a sand wedge, or a lob wedge? Depending on what you’re facing, each one of those clubs could be the right choice and the other two not so good. How about 50 yards? How about this one? Say the pin is 40 yards away and there are 30 yards of green to work with. Or, the pin is 40 yards away and there are ten yards of green to work with. Could you hit both shots with a lob wedge, but run the ball to the hole in the first instance, and fly the ball up close and stop it in the second? I could go on. Try playing a round with only five clubs plus your putter. You’ll have to do things with those clubs that you’ve never done with them before. The more things you can do with any one club, the more options you have for solving problems the course gives you. This is a great way to become a better scorer. Here’s a way I found to get consistent distance control on the green. Set down five golf balls about six inches apart from each other in a line running away from you. Putt each ball, using a smallish stroke that has a “feel” to it such that you can make that same sized stroke every time. The important thing is to not put any “hit” in the stroke with your hands. Let the weight of the putter do all the work. Do not look at the ball after you have putted it. Keep your eyes on the ground in front of you. After you have putted all five balls, take a look. There should be a tight cluster. Step off the distance to that cluster. That’s how far the ball goes when you putt it with that length stroke. Find a several other “feel right” lengths and find out how far the ball goes with them. I have a small stroke that goes 15 feet, and medium stroke that goes 24 feet, and a long stroke that goes 35 feet. These distances, and the ones you get, can be adjusted on the course before the round with a few experimental putts on the practice green. This method takes most of the guess-work out of approach putting. If you go to YouTube and search the golf videos, you find more people than you can shake a stick at have put one up. Why not you? Go ahead, but just make sure it’s worth your name. The actual content, that’s up to you. It is a piece of film-making, though, so follow these tips to upload something that is watchable. As for your filming equipment, there are too many hardware options for me to discuss, so let me just say this one thing. Mount your camera/iPhone/whatever so the image stays still. You don’t want people getting seasick when they watch your video. Sound must be spot on. The microphone built into your camera is not good enough. A remote mike is critical. An Audio-Technica Pro 88W/R is inexpensive and works great. You also need film editing software. Mac users have iMovie built in. Windows users can use Movie Maker. One video, one subject. If you have two ideas, make two videos. Write a shooting script. Define each (camera) shot and write down what you’re going to say. Get the dialog tight and don’t repeat yourself. Less talk, more action. Then rehearse. Get to the point right away; that is, start by showing the viewer, within the opening 15 seconds, what they are there to learn. If a minute has gone by and you still haven’t gotten to the good stuff, odds are the viewer will click off and try someone else’s video. This all adds up to about a minute and a half, and that is all the time you need to make your point. If the viewers didn’t get it the first time, they will watch again because it’s short. Do not build that repetition into your video! When you film, set yourself up in front of a neutral background that will not compete with you for your viewer’s attention. Get the camera close enough so necessary detail can be seen. For example, if you’re discussing the grip, get a shot from waist to head so you can see the hands clearly. Vary the point of view. Try to take a few shots from the golfer’s point of view if necessary. Say you’re taking about a shot that has a setup with an open clubface. Get a shot looking down as the golfer would see it of what an open face looks like, and how much you’re saying to open it. Remember, keep it short and to the point, and your videos will be quite popular. Here’s one of my early videos that nonetheless gets going right from the start, varies the point of view, and has solid content through to the finish.